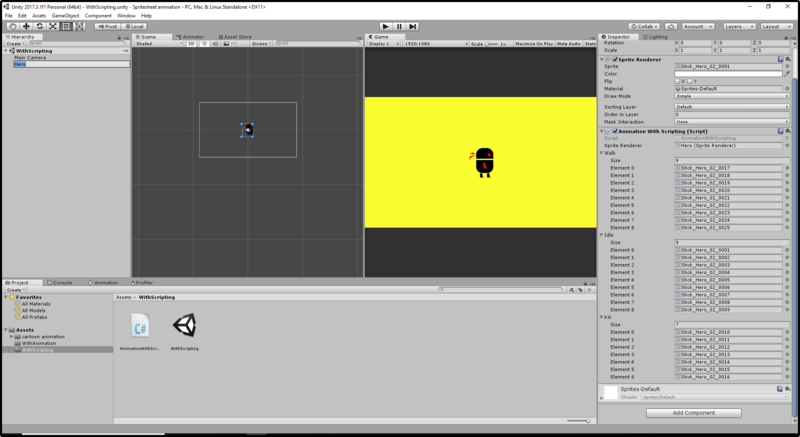 The main objective of this blog post is to give you an idea about how to do Sprite Sheet Animation in Unity3D. Are you looking for animation in your 2D games? Do you want your Character have some real feel and look more living ? Then here it is, I’ve brought you some easy and quick ways to make your game look attractive and give a real life feel to the character of your game. In this post we will learn how to give animation to your game character with 2 easy ways. By Animation And Animator controller. So tight up your seat belts and get ready for this joyful ride! First set up the scene like the given image. Don't forget to add sprites folder that will be use for the the different animation to your scene, if you don't have the Sprites you can download it from here. 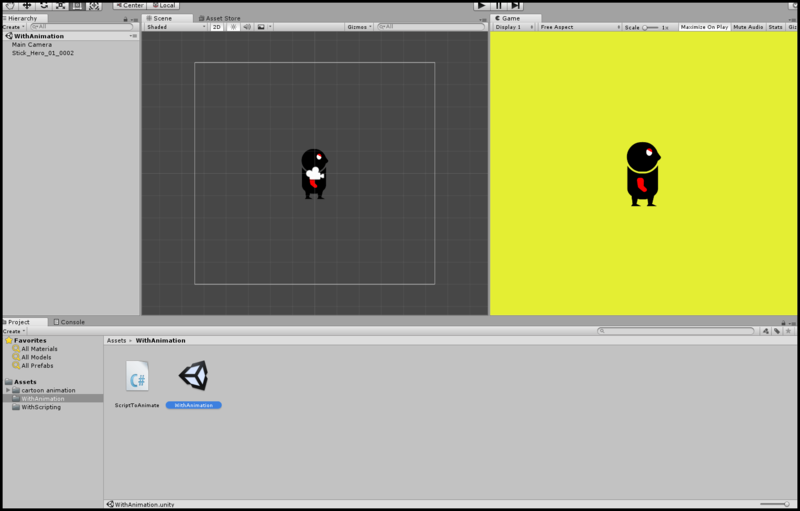 Create a 2D sprite object and assign the first sprite of the idle Animation to it. (Idle animation is the animation in which the character is just standing still and breathing no other activity). Create the Script named AnimationWithScripting and attach it to hero Object. Now, follow the below steps to create the different animation. 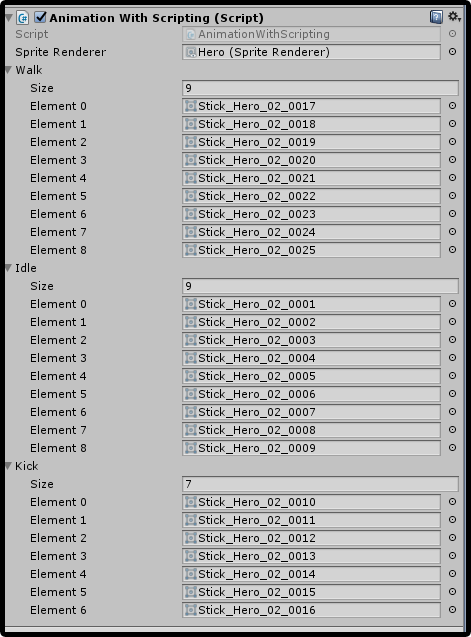 First select all the sprites of Idle Animation folder and drag it on our hero object and drop there, a new animation will be created. Then Unity will ask to name the animation name it as Idle. Then select all the sprites of Kick Animation folder and drag it on our hero objectand drop there , a new animation will be created. Again Unity will ask to name the animation name it as Kick. Then select all the sprites of Walking Animation folder and drag it on our hero objectand drop there, a new animation will be created. Again Unity will ask to name the animation name it as Walk. I hope you all are ready with your 3 animations. The animator controller will be automatically added to our hero object. Now set the transitions and trigger as per the below image. Let’s see what's there in the scripts. Go to Unity now and play the scene you will see the idle animation playing default. Now press the keys I, K and W respectively and check. Did you see your character..? Yeyy ! your character got life. Your character is breathing, kicking and walking. I'm sure you are on the right track. Now, let’s move to another method. Now go to Unity and add the sprites of walking, kicking and idle state in their following lists in the inspector as per the image. Let’s see what's there in the script. In this script, the coroutine is used for Sprite Sheet animation. If you don’t know how to use coroutine. Don't worry our coroutine unity blog post will help you. Trust me you will be master in 10mins. Start() Unity Callback To start the idle coroutine. SpriteRenderer spriteRenderer; variable To store the reference of the spriterenderer of the object. Now, go to Unity and play the scene you will see the Idle animation playing default. Now press the keys I,K and W respectively and check. Yeahhhhh ! Again you see character, its breathing kicking and walking. But wait which one is more optimised? Yes, maybe you would be having the same question. Both the methods run the same way when checked in the profiler. So, it's up to you whichever you feel easy and quick and in accordance to the requirement of your game.